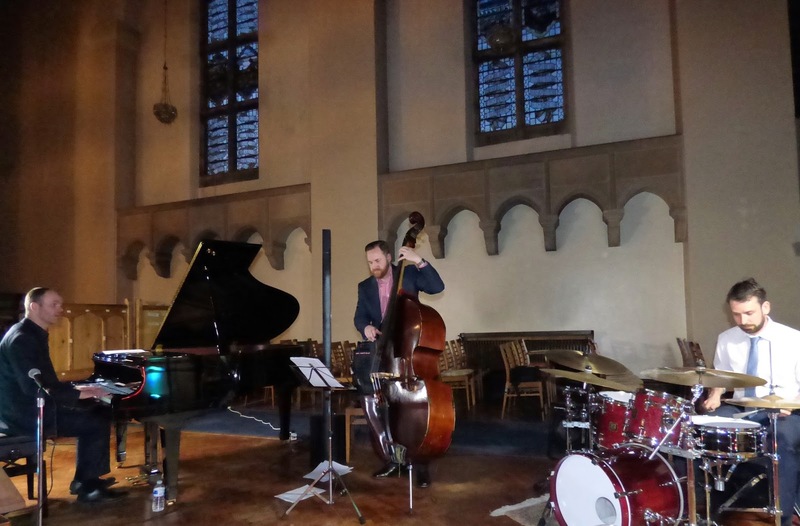 On a beautiful spring evening, St James’ and St Basil’s Church in the Newcastle suburb of Fenham presented the first in a new series of jazz concerts – ‘Jazz at J’s & B’s’ – featuring the brilliant Paul Edis Trio. 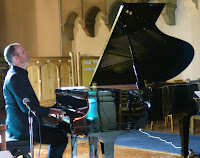 The church recently acquired a superb Kawai piano and the concert series’ promoter did what anyone with ears would do…engage the services of pianist Paul Edis. This inaugural concert – let’s call it a ‘gig’ – attracted promising numbers; some familiar jazz gig-goers, some parishioners and perhaps one or two curious locals. 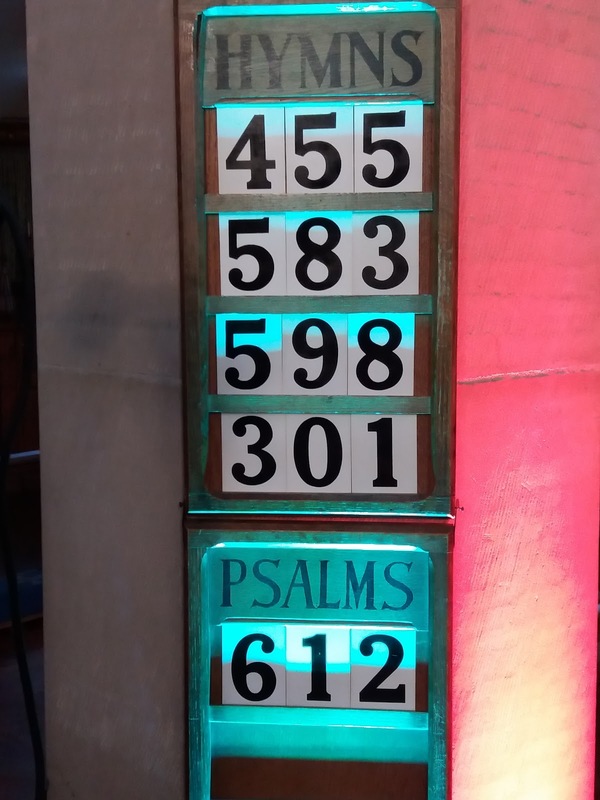 The curious local and/or the non-jazz fan could be forgiven if they thought the church service hymn numbers attached to a stone pillar would form the basis of the evening’s proceedings (see photo)! Paul Edis chose to present his ‘A History of Jazz Piano’ set. This was exactly what Dr Jazz ordered given that Jazz at J’s & B’s is a new venture. Joining Dr Edis for the occasion were two of the finest musicians on Planet Jazz; Andy Champion, double bass, and Adam Sinclair, drums. There is much talk of A-listers, take it as read, these three are the real deal. The format simple; present a selection of the music of some of the great jazz pianists, add in two or three of Paul Edis’ compositions, play two sets, without a doubt a winning combination! It’s Only a Paper Moon (Nat Cole) for starters and from then on one fabulous tune after another… Moten Swing (Oscar Peterson’s Night Train album) Bill Evans’ My Romance, let’s call it jazz piano paradise. At this point, Edis quipped: This is a lovely piano, thank you for buying it for me! 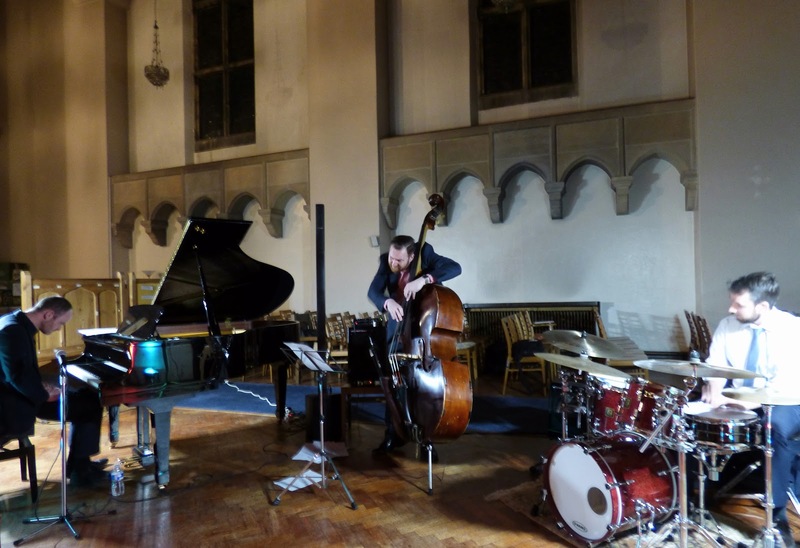 Two of Paul Edis’ compositions were placed at the mid-point of the trio’s opening set – Snakes and Ladders and Lucky Eleven, the latter, in part, to do with the 11 bar structure of the piece – giving us an insight into our pianist’s jazz and non-jazz influences (Debussy? Satie?). 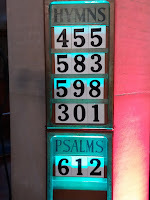 Edis noted that Horace Silver’s The Preacher was an apposite selection given that we were gathered together in a church! And, in praise of Dave Brubeck, the Paul Edis Trio closed a magical first set playing the quirky, no, make that ‘difficult’ time signature of Unsquare Dance. First Edis, then drummer Adam Sinclair, did what musicians are capable of doing (unlike some of us non-musicians), they made the tune’s hoe-down hand-clapping sections appear easy, all the while bassist Andy Champion doggedly refusing to be sidetracked from keeping it firmly in the pocket, no doubt engaged in his own counting-in-the-head exercise! Regional youth big band Jambone plays Edis’ Whiskers and the composer thought he would play it as a trio here in Fenham. For ‘whiskers’ think ‘brushes’ said Edis in introducing the first number of the second set and what we got was another masterclass from Adam Sinclair. Simply immaculate. George Shearing’s Lullaby of Birdland produced yet more amazing piano playing and another fine solo from Champion. More Bill Evans with Edis pointing to a tune the composer wrote at the age of twenty-one! One sensed Edis’ admiration for Bill Evans as the trio played Very Early. Time for another composition by our bandleader. The Long Way Round was inspired by travelling on the Metro (Tyne and Wear’s rapid transit rail network), perhaps daydreaming, perhaps deep in thought, perhaps about to meet up with a loved one. An earlier reference to Bill Evans composing great tunes at 21 prompted Edis to talk about Billy Strayhorn’s Lush Life…composed at the grand old age of sixteen! Further, Edis made reference to pianist Phineas Newborn Jr, it is clear that our man is engaged in serious study of the jazz piano greats. Long may it continue. Almost time to go but not before a brace of TS Monk to send us on our way. First the bizarrely titled Ba-Lue Bolivar Ba-Lues-Are (typical Monk, really), then Rhythm-a-Ning. What a blast! This opening concert at St James’ and St Basil’s couldn’t have gone better. 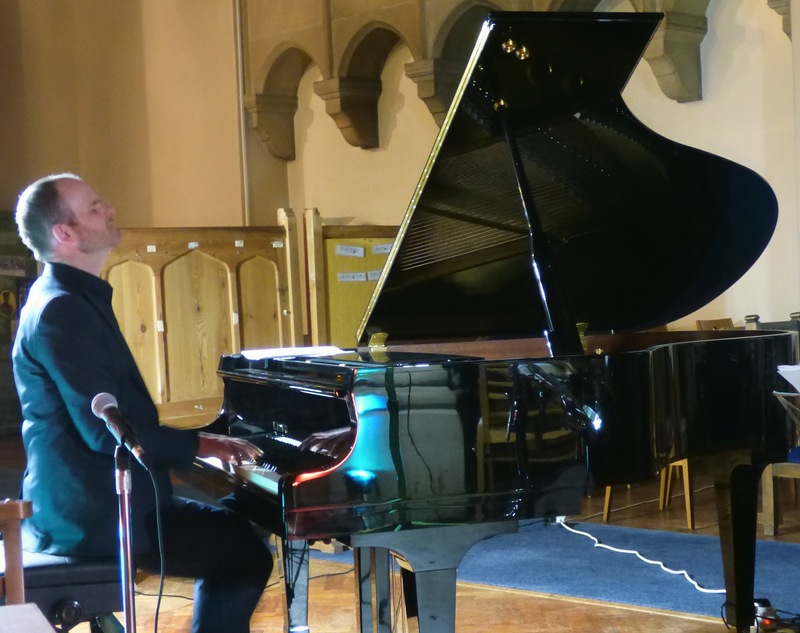 The good news is the Paul Edis Trio will return next month (Thursday 17 May) to play a second concert, this time with a multi-reedman of some renown…the one and only Alan Barnes! It’s a 7:30 start (doors 7:00), £10 on the door. St James’ and St Basil’s piano is a major asset to the regional jazz scene, the acoustics in the vast space didn’t adversely impact upon the sound of the Kawai, although Andy Champion’s imperious double bass playing wasn’t quite heard to best effect, and if there was one drummer who’d make it work in such a space it was Sinclair, a master of the brushes. These are minor quibbles, the space is as it is, it is something we can live with. Jazz lives…in Fenham! Sounds great but what was the beer like? There was a decent selection of bottled beers including Badger and Belhaven, sensibly priced at £3.50. a bottle. Plus, the wine wasn't too bad either! But who cares - when the music is top class like this.